Thousands of people demanding action over climate change descended on London today for a mass lobby of UK politicians organised by The Climate Coalition. They travelled from all over the country to Westminster to ask their local MPs to take a stand in the global fight against climate change. Hundreds more who couldn’t make the rally emailed their MPs with similar requests. 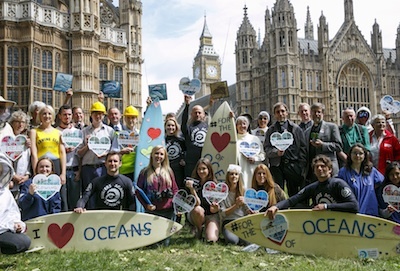 The UK’s biggest ever climate change lobby brought together Britons from every walk of life – including anglers, bee keepers, snowboarders, surfers, doctors, wildlife enthusiasts, grandparents, nuns, priests and farmers. More than 9,000 people attended in person to meet face-to-face with their constituency MPs on the embankment outside Westminster to explain why they want the new Parliament to support national and global efforts to hold back CO2 emissions and build a cleaner economy. Together with the hundreds taking on-line action, the lobby was more than 10,000 strong, and by early afternoon the campaign hashtag #fortheloveof was trending at #2 on Twitter in UK. The Climate Coalition wants politicians to work together across party lines to create a low-carbon infrastructure plan, covering energy and transport and the restoration of nature. Those who attended included Double Olympic Gold Medallist and quadruple World Champion rower Andrew Triggs-Hodge who said: “Climate change threatens many aspects of human life – and changing water patterns is one of the main risks. Catholic nun, Sr Karen Marguerite d’Artois OP said: “I’m here today because I care passionately about our world and what is happening to it. The earth is God’s creation which has been entrusted to us. We have an obligation to care for it. Surfers Against Sewage CEO Hugo Tagholm said: “The UK’s amazing waves, oceans and beaches, and the surfers that use them are under threat from climate change. Bernard Llewelyn, a farmer from Carmarthenshire who also runs a tourism business said: “Climate change is a big issue for farmers. I’m joining this lobby because I’m concerned about the impact it will have on our family farms and the beauty of rural Wales. Groups attending the lobby included WWF UK, Greenpeace, Oxfam, CAFOD, Christian Aid, Women’s Institute, Friends of the Earth, Tearfund, Surfers against Sewage, Angling Trust, Wildlife Trust, Medsin, Islamic Relief, World Jewish Relief, and many more.